Today the FOMC raised its target Fed funds rate to 1.0% as expected. However, Treasury yields fell 10-20 bps or so in the aftermath of the announcement, suggesting that the bond market had been nervous that the Fed would signal more aggressive rate hikes in the future—which it didn't. Once the dust had settled, we see that 5- and 10-yr Treasury yields are largely unchanged over the past three months, while 2-yr yields are up only 5-10 bps. This further suggests that the Fed and the bond market have been thinking along the same lines for the past several months; the bond market expects the Fed to continue deliver on its promise to raise short-term rates only gradually for the foreseeable future. Whether this expectation holds going forward is the real question at this point, and the answer will depend on the evolution of the economy and inflation. But for now, expectations and reality look to be in rough equilibrium. Not surprisingly, the stock market took heart from the relative calm, as prices firmed. One very important measure of the effective stance of monetary policy is the inflation-adjusted Fed funds target rate. 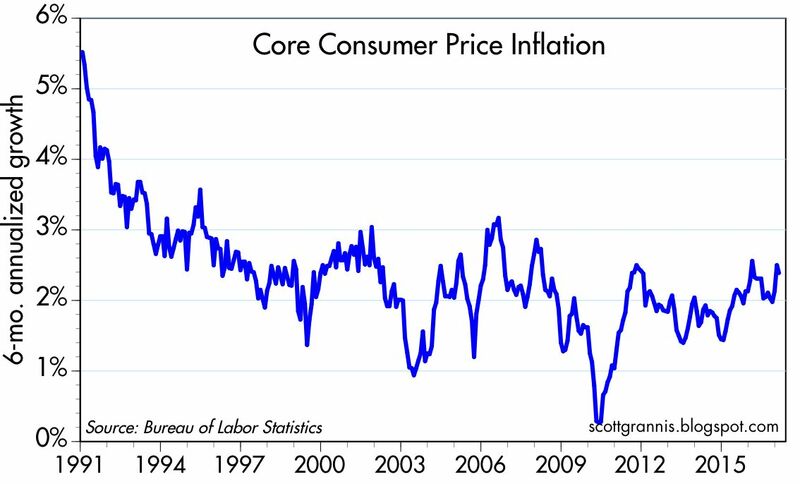 By changing the real level of its funds rate target, the Fed attempts to influence the world's demand for money. 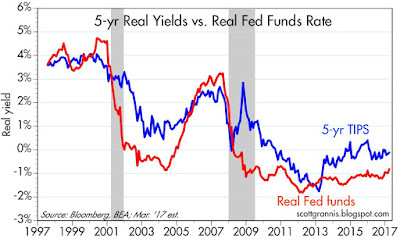 Higher real yields are intended to increase the demand for money (while also making borrowing less attractive), whereas lower real rates do the opposite. Given the relative tranquility in the bond market and the economy in recent months, we can infer that the Fed's efforts to date have not made any significant change in the balance between the Fed's supply of money and the market's demand for it. In other words, the Fed's "tightening" actions to date have been largely offset by the market's decreased demand for money, a phenomenon which goes hand in hand with increased confidence and a modestly improved economic outlook. 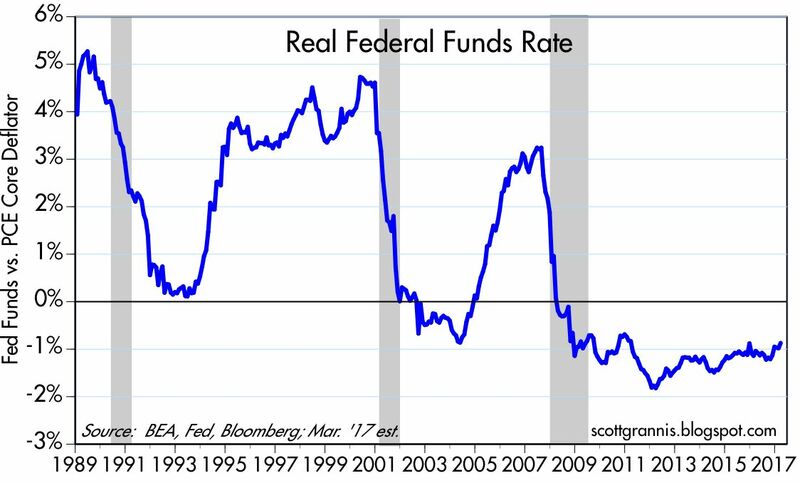 As the chart above shows, the real Fed funds rate (using the core PCE deflator—the Fed's preferred inflation gauge—to discount the nominal Fed funds target) has increased from -2% a few years ago to just above -1% today. 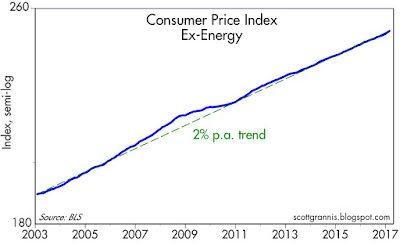 That's not really a "tightening," and is better thought of as the Fed becoming "less easy." 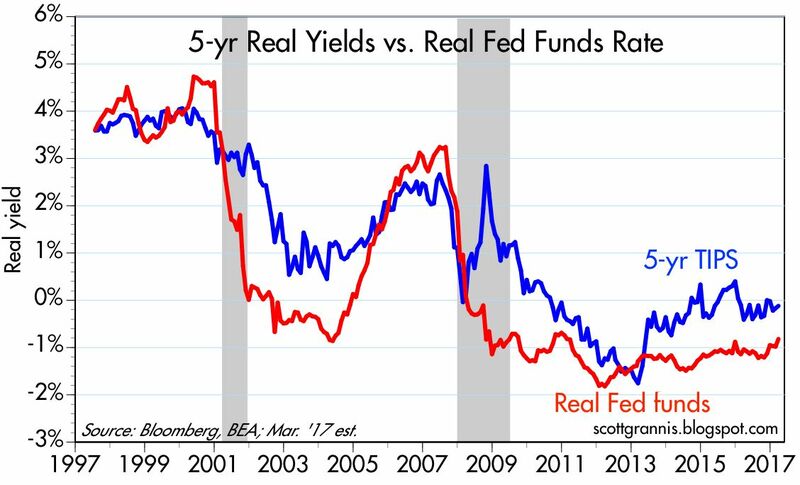 The chart above compares the real funds rate (red) with the market's expectation of where the real funds rate will be in 5 years (blue). As long as the future expected rate is higher than the current rate, the bond market is expecting the Fed to continue to raise its target real rate. But when the red line exceeds the blue line—as it did prior to the last two recessions, this is an excellent sign that the market expects that the Fed will sooner or later be forced to lower its target rate because the economy is expected to weaken. 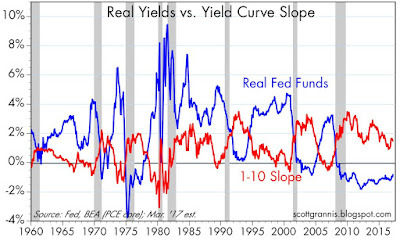 An inverted real yield curve (when short-term real rates exceed longer-term real rates) is thus an excellent indicator of a coming recession, and the market's way of telling the Fed that monetary policy is too tight. Today the market is signaling "steady as she goes," which translates into continued moderate and measured increases in short-term rates—much as the Fed is promising. The chart above gives us another way of measuring the effective stance of monetary policy, by comparing the level of real short rates to the slope of the Treasury curve. 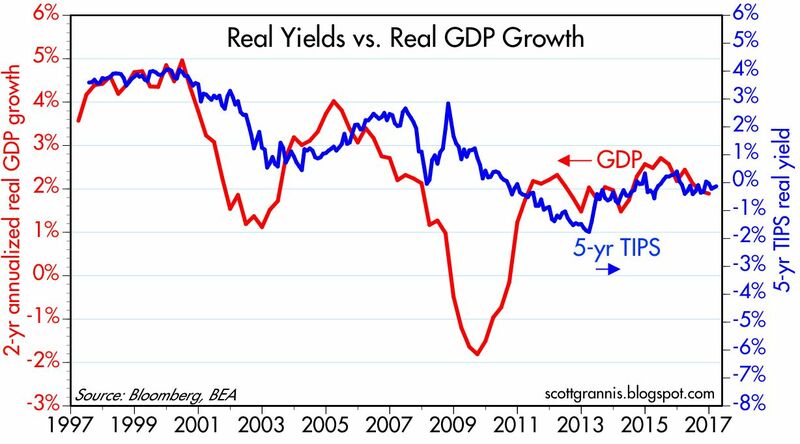 When real rates are very high and the yield curve is inverted (i.e., when short-term rates exceed long-term rates) monetary policy is very tight and the economy inevitably succumbs to recession (think of the economy being starved of liquidity and subsequently collapsing). We are likely years away from such a confluence, since real short-term rates are still very low and the yield curve is positively sloped. 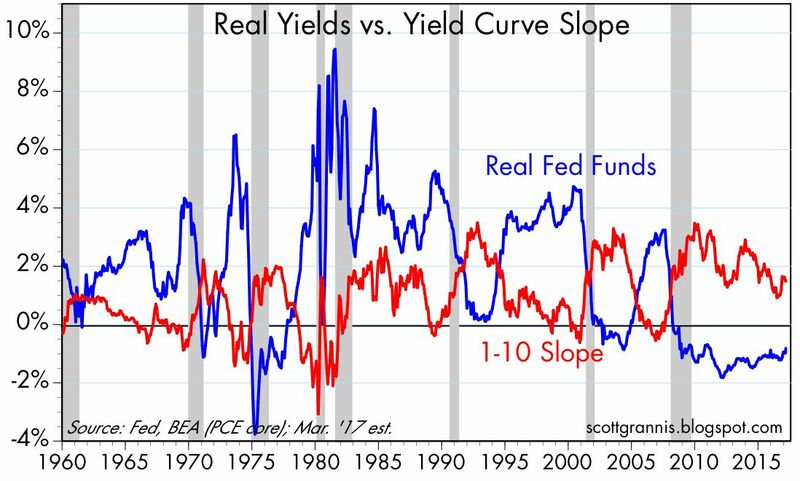 The level of expected real short-term rates (blue line) also tells us about the market's willingness to pay up for "safety." 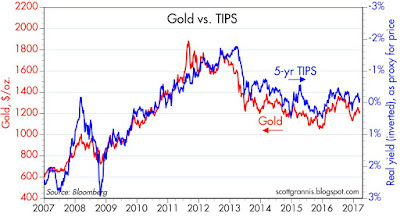 As the chart above shows, gold prices and TIPS prices (using the inverse of their real yield as a proxy for their price) have been moving together for many years, and both have been slowly declining since 2012 (when fears of a Eurozone collapse triggering another global recession were intense). This suggests the market has slowly been regaining confidence and losing its risk aversion as the memory of the 2008 crisis fades, the economy proves resilient, and an era of improved fiscal policy approaches. 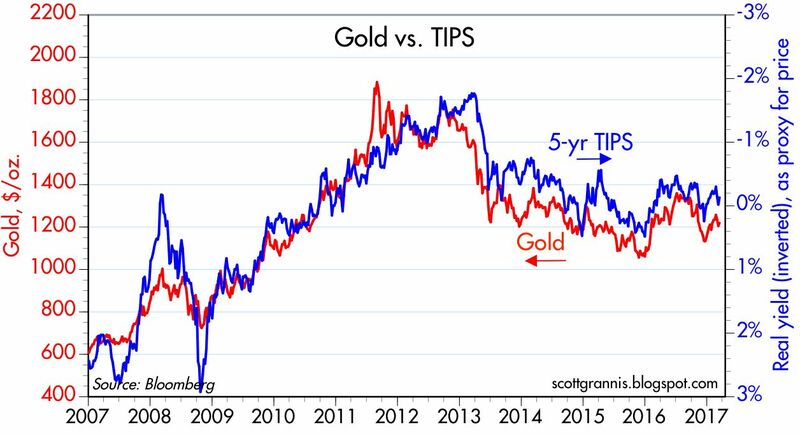 So far, nothing dramatic has happened, and I would argue that both TIPS and gold prices still embody a good deal of caution with regards to the future. 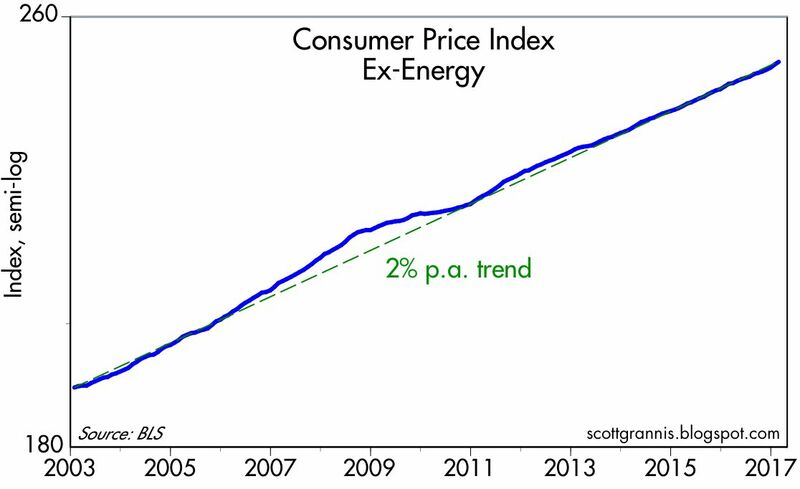 As the chart above shows, the underlying trend of the consumer price index (ex-energy) has been about 2% per year for the past 14 years. 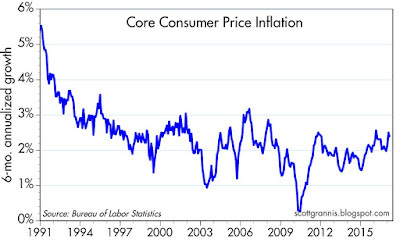 Over the past six months, the core CPI is up at a 2.2% annualized rate, which further suggests that the core PCE deflator is currently rising at just under 2%, which is close enough to the Fed's target to effectively rule out any risk of deflation or fear that the Fed has been raising rates too much or too fast. 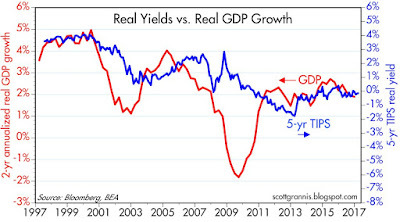 The level of expected real short rates (blue) also tells us a lot about the market's expectations for economic growth. Here we see that the recent rise in real short rates is very modest, and that means that growth expectations have only firmed modestly in the past year or so. Conditions today are a far cry from where they were in 2000, when the market fully expected economic growth to average 4% a year or more for the foreseeable future. Right now it looks like the market is priced to 2-2 ½% growth for the foreseeable future. That further suggests that if Trump manages to deliver decent supply-side policy changes (e.g., significantly reduced regulatory burdens and lower marginal tax rates), and if those policies result in growth of 3-4%, then we ought to expect interest rates to move substantially higher. So far the market is taking a wait-and-see, albeit modestly-optimistic attitude. What is wrong with the U.S. raising several billion dollars of 50 year treasury bonds given the global demand ? Nothing wrong with that, except that Treasury should have done this last year. I do not know if the above link will automatically give you the last year of this banking stock index. The short story is bank stock index took off last Nov/December when it was trading in the 70 range, and ran up to the present 95 range. A huge run-up. Hey, good, I like a solid banking sector, and I like profits and boom times and everything. This coincides with the Trump election, but also with the outlook that the Fed would start raising the rate it pays on interest on excess reserves. Mostly I am annoyed that I was not heavily invested in a bank ETF, but beyond that I ponder if banks are counting money made by sitting on reserves and earning IOER. Getting paid to do nothing on reserves they did nothing to get. "Cubic Global Defense (CGD), a business unit of Cubic Corporation (NYSE: CUB), today announced it received a contract award worth more than $42 million from the U.S. Army Contracting Command to support live, virtual and constructive (LVC) training services for the Joint Readiness Training Center’s (JRTC) Operations Group at Fort Polk, Louisiana. Cubic will support rotational and pre-deployment training exercise requirements from April 1 to August 24, with Phase Out requirements from August 25 to October 23, 2017. Under the contract, Cubic will continue to assist the JRTC with integrating U.S. and allied forces into rotational training exercises through scenarios focused on Decisive Action and theater-specific operational environments. These exercises are high fidelity, capstone training events conducted at the U.S. Army Brigade Combat Team and U.S. Army Special Operations Forces Operational Detachment B level. These types of exercises are conducted for units targeted for deployment in support of ongoing military operations overseas and include situational training, live fire, force-on-force and integrated (LVC) training. Cubic will also provide expanded Role Play, technical support for combat training instrumentation, battlefield effects, video and cultural role players (foreign language speakers). U.S. Air Force Close Air Support and Air Mobility units will be fully integrated into the play of each exercise." You can't make this stuff up. The federal government can screw anything up, and I mean anything. Benjamin: What makes you think this is a screw-up? These types of things are very intentional; it's legal fraud/corruption on a massive scale. And there is no entity that could oppose it to any effect. They'd be accused of being unpatriotic (which has to be one of the grandest ironies I've ever come across) or (much, much) worse. Re banks: Don't forget that the interest the banks earn on their reserves (for which they invested money) is the lowest rate of interest available in the market. To be sure, it's also a risk-free rate of interest, but the banks have lots of alternatives (e.g., loans to the private sector) that pay a lot more, but which are also deemed risky. What has helped the banks is not a higher IOER so much as it is a normalization of the entire interest rate structure PLUS some improvement in the economy's prospects—which makes loans to the private sector more attractive.